The GRO or the General Register Office hold records of all births, deaths and marriages registered in Ireland. Civil registration in Ireland commenced in 1864, when it became compulsory to register these events. It should be noted that non-Catholic marriages were being registered from 1845. Civil registration in Ireland commenced quite late, when compared with England, which commenced in 1837 and Scotland in 1855. Each event was registered in the local registration district, which correspond with the dispensary districts set up under the Poor Law system in Ireland. The local registrar recorded the details of each event in a registration book. Once filled, the book was forwarded to the superintendent registrar for that district, who would copy the entries and forward the copy to the General Registry Office in Dublin. The copies sent to Dublin were used to compile the all Ireland indexes of births, deaths and marriages. These indexes are what we use today to locate references to births, deaths and marriages in Ireland. The fact that the registers sent to Dublin were copies of the original records points to the possibility that errors or omissions may have been made between the original registration and the lodging of the copy in Dublin. I have occasionally found a birth or marriage that was missing from the centralised records in Dublin but was found in the records for the local registration district. Although civil registration in Ireland was compulsory, it is estimated that in the early years of civil registration up to 15% of births and marriages went unregistered. It is also estimated that the number of deaths not registered was even higher. Just because your ancestor was born in Ireland after 1864, does not mean that their birth was registered. Before you start your search try to familiarise yourself with the various registration districts that were in place in the county you are researching. The registration district was the same as the Poor Law Union. If you are searching for a birth, death or marriage certificate for your ancestor you must start with the indexes. The hard copy all Ireland indexes are available to consult in the Research Room of the General Register Office, which is now located on Werburgh Street in Dublin City (see map below). It costs €2 to consult five consecutive years of birth, death or marriage index books. Bearing in mind that many given dates of birth are incorrect, it is always sensible to search at least two years either side of a given date for a birth or marriage. When searching the indexes, it is also important that you take into account the various spellings that might have been used for the surname you are looking for. There is usually one index book for each year and after 1877 the books are divided into four quarters. Remember, you will need to search each book four times after 1877. The indexes are organised alphabetically, and you may note late registrations and corrections written into the margins on some pages. If you can’t get to the Research Room in Dublin to consult the hard copy indexes you can start your research online. The indexes have been transcribed by the Church of the Latter Day Saints up to 1959 and are freely available online at www.familysearch.org. The same collection is also available at www.ancestry.co.uk and www.findmypast.ie. The indexes have now also been published on www.irishgenealogy.ie but only births over 100 years old, marriages over 75 years old and deaths over 50 years old. Remember, these online collections are only the index entries for births, deaths and marriages. The actual birth, death and marriage certificates they refer to contain much more information. You can use the reference information found in the indexes to order a copy of the original certificate. With this information a copy of the birth certificate can be obtained from the General Register Office. The birth certificate should record the date of birth, place of birth, name of the child, name and occupation of the father and name and maiden name of the mother as well as the name of the person who registered the birth, which can often be another family member. The cost of each certificate, if purchased in person at the General Register Office Research Room is €4. Timeline have a certificate ordering service and can send out digital copies of any certificate you require. Once you have the details from the indexes, click here to order the certificate. The General Register Office do not just hold birth, marriage and death registrations from 1864 and non-Catholic marriages from 1845. They also hold the marine registers, for births and deaths at sea and the army registers, for births, deaths and marriages of those serving with the British Army. These vital records are one of the most valuable sources for genealogical research in Ireland and are well worth pursuing. 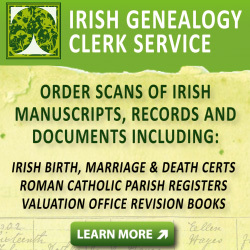 For more information about searching the General Register Office for births, deaths and marriages consult our guide to Tracing your Irish Ancestry Online. Monday to Friday, (excluding public holidays) from 9.00 a.m. to 4.30 p.m. The last orders for certificates are taken at 4.00pm.